Squirrel caught up with Lorelei Mathias from LEMON Comedy on the eve of the 2018 Melbourne International Comedy Festival. LEMON Comedy bills itself as “a global comedy showcase that aims to promote diverse voices in stand-up, and comedy with a cathartic flavour”. Initiated a little over a year ago, the founders set out to find a way to celebrate comedians of colour; female-identifying and gender non-binary comedians; Indigenous comedians; comedians from the LGBTQ+ community; comedians living with mental illness, and comedians living with disability. The name comes from the experience of people of diversity feeling like a lemon – feeling left out or left to one side. Inclusion is about never feeling alone. And that’s what LEMON is all about – inclusion. And it works both for the performer and audience. Some of their stories shake people out of their comfort zone she says. But for some audience members, the experience makes them feel less alone – sometimes for the very first time. That they’re hearing someone on stage talking about things that are very real to them, and surrounded by a like-minded audience, can be a very liberating and self-affirming. At the same time, it’s a great avenue through which performers of diversity can get their stories and experiences in front of a paying crowd. It works for comics feeling less alone, as well as audience members Lorelei says. Comedy has the power to do that. 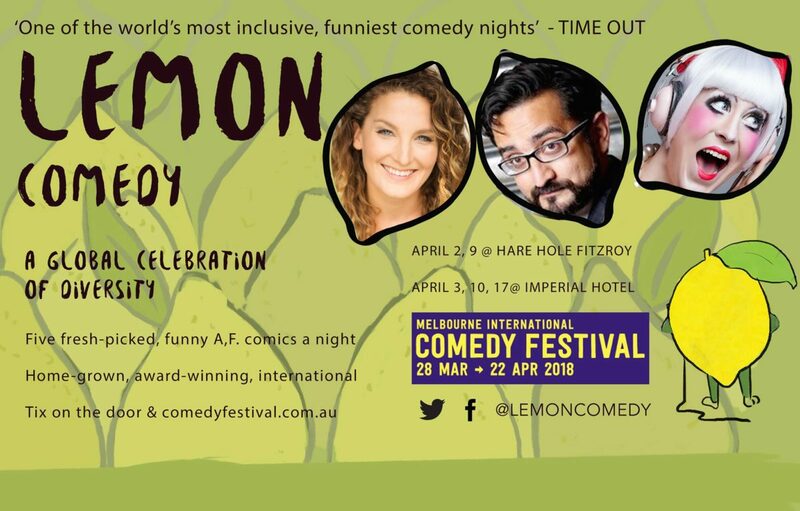 LEMON comedy has an impressive line up for the MICF. They’re doing five comedy showcases over five nights – April 2 & 9 at their usual home, Hare Hole in Fitzroy; and April 3, 10 & 17 at the Imperial Hotel. They have an impressive array of talent joining them for these events. ABC Radio’s Sami Shah is headlining at the showcase on April 2. Alice Fraser will have that responsibility for the showcase on April 3. And they have an imposing collection of surprise MCs and headliners performing with them over the festival. But I can’t tell you who they are!! The response from these star performers to the mission and aspirations of the company is extraordinary. They love the concept. It’s just great. They’re so supportive. In a profession where one is constantly walking the thin line that separates proper from improper (whatever that is), it’s so good to hear that ‘the cause’ is an important thing to headliners. I get the feeling that, as the LEMON comedy brand grows, they’re not going to have any trouble securing top quality, diverse acts to work with them. The masterplan is for a global network of diverse comedy. LEMON is already established in Melbourne and London thanks to the hard work of its founders, Lorelei and Canadian stand-up levy Stamatov. They’d love to hear from anyone who can help them spread the word and establish in other places.